Robert Clayton Osborn, Jr. – Lieutenant Robert Clayton Osborn, Jr. passed away Tuesday, September 4, 2018, at the age of 59, with his family by his side. Service: A Celebration of his life: 1 p.m. Friday, September 7, 2018, at North Pointe Baptist Church, 147 E. Hurst Blvd., Hurst, TX 76053. Burial: Rose Hill Cemetery, 7301 E. Lancaster Ave, Fort Worth, TX 76112. Visitation: 6:30 to 8:30 p.m. Thursday, September 6, 2018, at North Pointe Baptist Church, 147 E. Hurst Blvd., Hurst, TX 76053. 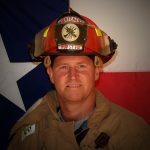 Robert served his community alongside his firefighter brothers 30 years for the Hurst Fire Department. Robert was the same to all people no matter who they were. He always put others first, a living definition of love – patient, kind, gentle, unselfish, hopeful, protective, persevering. To his family and friends he was a role model, hero, and their rock. He was preceded in death by his father, Robert Clayton Osborn, Sr.; sister, Sherri Osborn; grandparents, Bob and Iva Osborn, and George and Marjorie Hamontree; and nephew, Cole Fite. Survivors: Robert is survived by his mother, LaWanda Osborn; the love of his life, wife of 37 years, Annette; daughter, Jenny and husband James; son, Jordan and wife Megan; daughter, Alisha and husband Danny; grandblessings, Clayton, Clark, Sam, Joe, Tyler, and Tenley; brother, David; sister, Christi and husband Terry; sister, Suzan and husband Bruce; nieces and nephews: Cheyan, Brooke, Eric, Brittany, Hannah and husband John, Emily, Will, and Adam and wife Kelly; great-nieces: Harley and Hayden; great-nephew, Leo; numerous brother and sister-in laws, extended family, and friends. My deepest condolences and many prayers for the Osborn family. Robert was a Godly man and I hope it brings peace to your heart knowing he is with our Heavenly Father and in no more pain. I love you all! To the Osborns: My condolences on the passing of Robert. Robert was such a good person. Always friendly, smiling and shaking hands. As a Hurst Officer I admired Robert for his professionalism as well as his athletic ability. Back in the day, the Police and Fire department were very competitive on the hardwood floor of Bell high school. I called him, "Sky Osborn", because of his leaping ability. My heart is sadden at his passing. I rest in comfort that he is in a heavenly place. He will be missed. Robert was always a great example of what the scriptures refer to as loving your neighbors. Our neighborhood was better because of him and his family. I am so sorry for your loss! Praying for peace and comfort. Robert was a great man of faith who truly left a great legacy.